Some would find this AI-generated pain delicious. Others would want to yell at their parakeets. AI researchers, as discussed in two papers, are exploring how generative adversarial networks (GANs) can create new levels to two popular games. In two separate papers on arXiv, the teams explored GANs to deliver new video game levels. Super Mario and Doom are the focal points by researchers seeking to add new levels of toughness—like "imagine the frustration of playing a game where the difficulty can constantly change," said The Register. For those (a handful) readers who don't know who Super Mario is, this is "a popular platform game controlling a mustachioed man in red overalls to collect coins and avoid enemies to reach a princess," said Katyanna Quach. And Doom? She said, this was the "classic first person shooter from the early 1990s." "DOOM Level Generation using Generative Adversarial Networks" is by three authors who have affiliations with Politecnico di Milano. "Evolving Mario Levels in the Latent Space of a Deep Convolutional Generative Adversarial Network" is by six authors with affiliations that include Queen Mary University of London, Southwestern University (Texas), TU Dortmund University, University of California at Santa Cruz and IT University of Copenhagen. 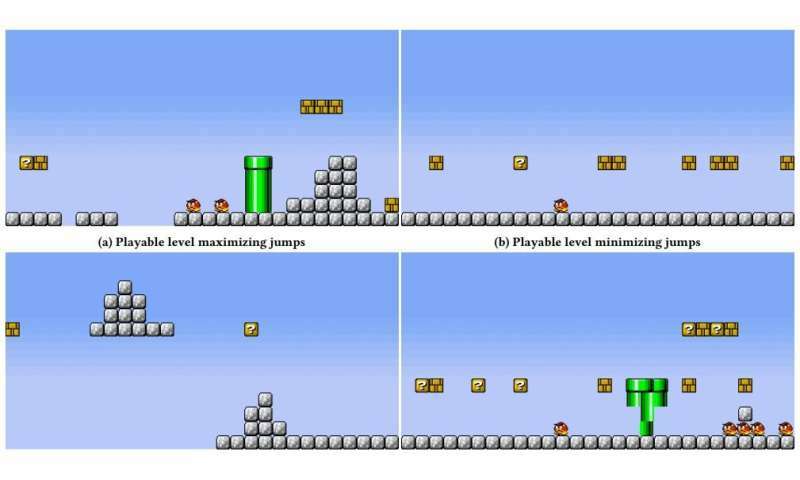 They said even though the specific game in this paper was Super Mario Bros, "the technique should generalize to any game for which an existing corpus of levels is available." Actually, if you are still not quite convinced you understand what is going on here, then MIT Technology Review's overview about DOOM on "Emerging Technology from the arXiv" of May 7 goes a long way. "The game is a first-person shooter in which a space marine battles to survive against various demons and zombies. The game is notable because it pioneered 3-D graphics for PCs running MS-DOS, introduced networked multiplay, and even allowed players to create their own game levels." So, yes, there already are levels of DOOM. But now, there is this twist. "Is it possible to use this data to train a deep-learning algorithm to create its own levels of Doom that a human would find compelling?" Tony Palanco, Geek.com: "GANs is a system of two networks called a generator and a discriminator. The generator builds false training data samples while the discriminator discerns whether the samples are real or fake. These two compete with one another. As the process continues, the generator creates increasingly realistic samples in an attempt to deceive the discriminator." This would not be the first time that a generative adversarial network (GAN) approach has made news. Last year, it was reported how two competing neural networks can result in a photorealistic face, with attention on a NVIDIA paper. In that paper, researchers discussed a way to generate faces via a GAN. Tom McKay in Gizmodo had described GAN as "a class of algorithm where researchers pair two competing neural networks against each other." One of the two had a function like rendering images or trying to solve a problem, while the other behaved in adversarial mode, challenging the first's results. The current Mario paper's authors mentioned photo images. They wrote, "Although GANs are known for their success in generating photo-realistic images (composed of pixels with blendable color values), their application to discrete tiled images is less explored." They said the results in the paper showed that "GANs are in general able to capture the basic structure of a Mario level, i.e. a traversable ground with some obstacles." As for the Super Mario GAN, up on GitHub you will find something called MarioGAN. The trained model is capable of generating new level segments, said the description, "with the input of a latent vector, and these segments can be stitched together to make complete levels." "Game makers rely on human expertise and extensive testing to create good levels. And because this is so expensive, many of them are looking for effective ways to automate the process or assist the game designer. Perhaps this it. Finding a way to automate level creation, at least in part, is a significant achievement. It should free up human designers to focus on bigger-picture issues, such as the type of level they want to generate. " I find this infinitely fascinating. Think about an 'adversarial AI' that could structure teaching material in a way so that it is presented to a student in a compelling manner. I.e. not too easy but just hard enough so that a student has to exert himself to the limit and stays engaged with just the right balance of success and frustration to incentivise him to keep on pushing. If you want 'tough' then try "super dram world" or similar (or just watch the masters play this stuff on "awesome games done quick" fundraiser events on youtube). It's insane.